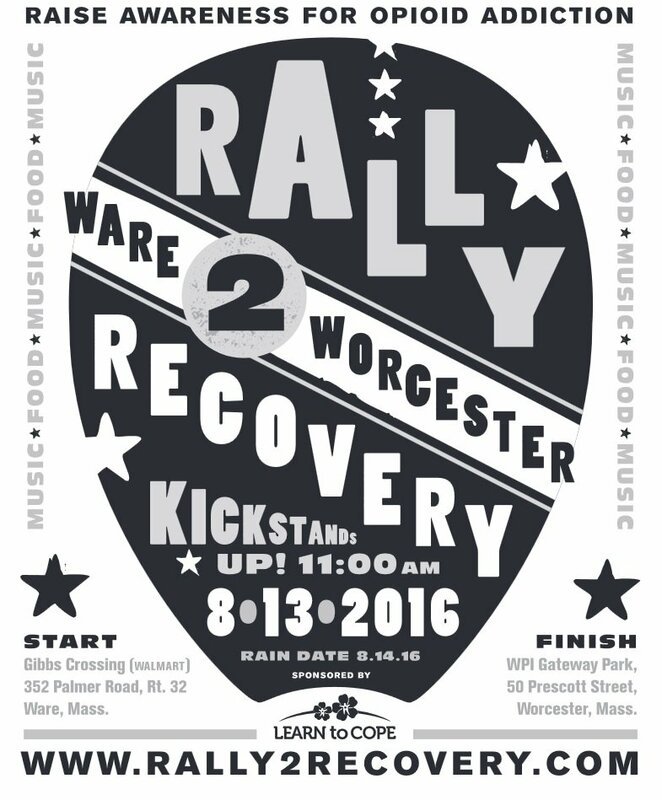 On Saturday August 13th, the first-ever Rally 2 Recovery is scheduled to kick off in Ware, Massachusetts. The 40-mile motorcycle ride will travel through towns hit hard by the opioid crisis and will end in Worcester. The finish line will transition into a community event with food, music, entertainment, and a resource fair. All activities are open to both riders and the public. For event organizers and Worcester residents Bruce Fiene and Tracy Wheeler, the 40 mile trip is one of the shorter aspects of their journey and is an endeavor of gratitude. When they discovered their teenage son was using heroin, their life turned upside down. By chance the pair discovered Learn to Cope, a non-profit, community network for families struggling with a loved one’s drug or alcohol problem. Now their son’s in recovery and they want to give back to the organization that gave them hope. Those interested in participating in the motorcycle ride will meet at 352 Palmer Road off Rt. 32 in Ware. Registration begins at 9AM and the ride kicks off at 11AM. For those interested in the community event, Worcester’s WPI Gateway Park will open at 10:30AM. Resources tables and entertainment will be open, but food venues will not open until 12:00PM when the riders are scheduled to arrive. The event will end around 3:30PM. In addition to sponsoring the event, AdCare will also be participating in the resource fair. If you have questions about treatment, or just want to say hi, come visit our booth!